Team Building Activity Ideas | Denver Murder Mystery Co.
A Denver murder mystery company party will encourage your team members to get involved in the celebration in a way unlike anything they have ever experienced. Call (888) 643-2583 or fill out the form to get a quote for your team building event. Live-action murder mystery parties are America's most commonly hosted type of corporate team building events. A company team building event is the type of gathering that really needs to be done right. If you want to impress everyone in the office, throw your own murder mystery company party in Denver! Also perfect for business milestones, company celebrations, and office holiday gatherings, our whodunnits will kick things up a notch for your next employee event. 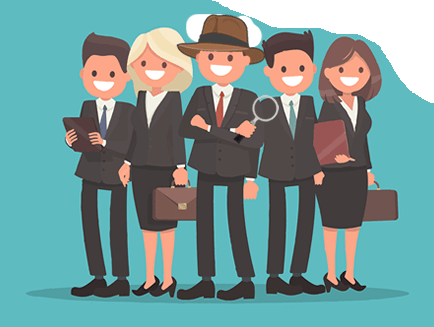 Offering the opportunity for employees to work with each other to solve a comedic case, the event will provide an excellent chance for everyone to put their skills of deduction and cooperation to good use. Given our excellent track record for throwing killer events for Fortune 500 companies, you can rest assured that a murder mystery company party is the ultimate idea for all of your future business events. Give our experts a call today at (888) 643-2583 to start planning your upcoming murder mystery company party in Denver! Whether you have eight people or 8,000, Denver Murder Mystery Co. has the sure fire event for you. Contact us now for a free price quote.